The Caster Chronicles series stands out among YA paranormal series for being well-written and having excellent, complex world building. The books are not the easiest to read - they're somewhat slow and detailed - but if you allow the books time to soak into you, you'll find that they're one of the most fulfilling series out there today. Beautiful Chaos is Ethan's book. The first two books in the series center on Lena's choices and Lena's personal demons. These are present in this book as well, but Ethan's own dilemma plays much more of a central role. Ethan continues to discover just what it means to be the Wayward. He displays great courage, compassion, and self-knowledge in this book as he decides what role he is willing to play. Back together after their separation in Beautiful Darkness, Lena is with Ethan every step of the way, although they're still hiding things from each other. You'd think that two people that can basically read each other's minds wouldn't be able to keep so many secrets. Lena's mother plays an important role here - or her memories do. Lena and Ethan realize that being Light or Dark is not as simple as it seems. I liked the extra dimension added to the Caster world building. The paranormal element is very complex and gets moreso with each book. It's fascinating. One of my favorite aspects of The Caster Chronicle series is the prominent roles played by the parental figures (ironically not the actually parents): Macon and Amma. Amma is the central figure in this story. She is increasingly haunted and pushing the limits of what she knows to be right to accomplish some goal that Ethan can't figure out. The steadfast, reliable Amma is wavering. I hate to see Amma not behaving as her lovable self, but I think it's a great plot device. And of course you have Link - the Linkubus. Not only is Link a joy to read about, but he furthers the paranormal element of the series. He reminds me of Simon in The Mortal Instruments, although they're not that much alike. I love that Link doesn't take anything serious, except maybe for Ridley. Even when the world is falling apart, Link manages to make everything seem better. He is a much appreciated ray of light in a very angsty series. 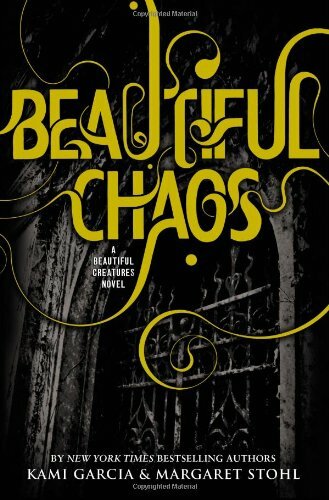 I can't say that Beautiful Chaos is my favorite book in the series. It was slow and harder for me to get emotionally invested in, but I think my love for it will come in time. Both Beautiful Creatures and Beautiful Darkness (BD in particular) were books that I enjoyed on the first go-round, but only came to truly love on a second read. There is so much going on in these books that I need to read them twice to appreciate them. That said, the ending of Beautiful Chaos was shocking! Well not that shocking since I guessed it would happen, but I definitely closed the book with horror knowing that I would have to wait a whole year to find out what was going to happen. I can't wait that long! I loved BC but was very disappointed in Beautiful Darkness. This book however was a little better than the sequel though I still struggled with some bits of the book. Great review. Great observation! The Caster Chronicles did stand out among the YA genre and is probably one of the slowest plot books, but I was always absorbed by the story I couldn't bring myself to hate it. Hmm, the more I read your review for this series the more I'm convinced to read them when all the books are out. Do you know how many books will be there in this series? I thought there were only three. I agree. THE CASTER CHRONICLES is an outstanding YA series and a favorite of mine. I can't wait to read the next book as well!! Oh, such a good point about this being Ethan's book... and what was with the ending to this book! Shocking doesn't cut it! I ADORED Beautiful Creatures, but I was kind of dissapointed with Beautiful Chaos. Was so happy with BC, but it felt a bit slower, and so, SOOOO bleak. Not necessarily bad things, but I swear I'm still reeling over that ending! Ugh! Still need to read Beautiful Darkness! I love what you had o say about the pacing, how it's slow and hard sometimes, but the writing really does soak in and leave an impression. Dude! The ending! I need the next book already! Glad to hear Ethan, Amma and Link are featured more in this story. I enjoyed the first two books! But like you I found them slow, especially Beautiful Darkness. Still I'm looking forward to reading this one. Great review!